The spare bedroom tax policy which was supposed to help the government save on housing benefit payments has instead turned into a chaotic nightmare, that many rightly predicted would impoverish even more the poor. The bedroom tax or "spare room subsidy" or "under-occupation penalty" – affects around 660,000 housing benefit claimants. According to research released by the National Housing Federationyesterday, an estimated 144,000 tenants have not been able to cover their rent since the controversial policy was introduced on 1 April. 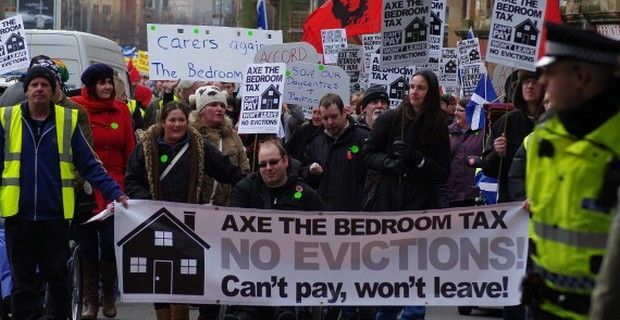 A poll of 183 housing associations found that 66 per cent of their residents hit by the bedroom tax are in rent arrears, and one in seven families have already received eviction risk letters and face losing their homes. A bill to abolish the hated tax will be introduced by Labour MP Ian Lavery. “We are talking about ordinary people who have been forced to move from the homes where they have spent a lifetime raising their kids. They have been cast out like dogs in the night." Lord Freud, the welfare minister, is currently being grilled by a committee of MPs to answer questions on the bedroom tax.